Aisoy, a spanish robotics startup, is motivated by the goal of building intelligent, personal, “social” robots, which make our lives easier and funnier. Their robot, the Aisoy1, is their first step towards achieving this vision. Robohub recently caught up with the team, to talk about social robotics, the Aisoy1, and the startup culture in Spain. Can you briefly give the readers an overview of the Aisoy1 robot, and the audience/experience level that it is targeting? Aisoy1 is an affordable, social-robotics platform designed for anyone over the age of 7 years, who wants to experiment with personal, emotional and social robotics, or just explore robotics and have fun. Our audience includes kids, adults, educators, artists and creatives who want to learn about social robotics technology. 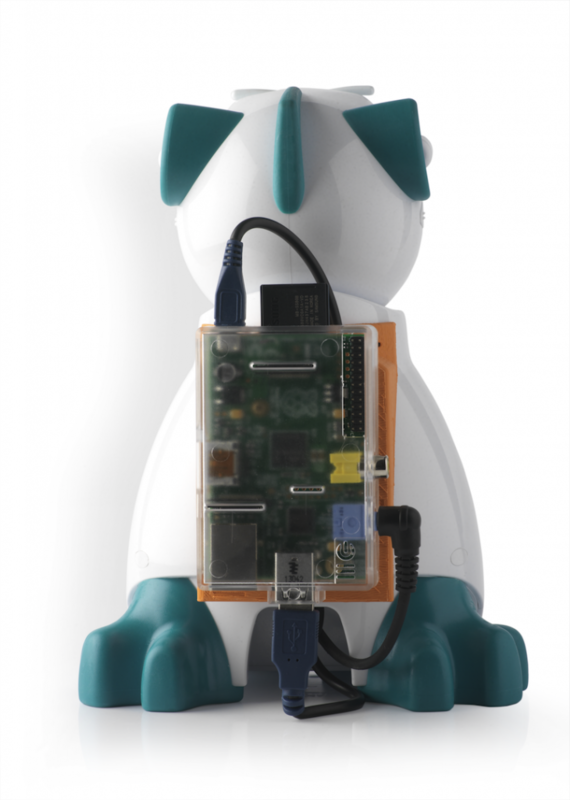 Aisoy1 is based on ROS and uses the Raspberry Pi (other single-board computers will be available soon). Beginners can program the Aisoy1 using AIDIA (a web based graphical environment) or using MIT’s Scratch programming environment. For advanced users who want to delve deeper, programming in Python or C++ is also an option. What do you mean by “social robotics”? Intelligent in the sense that it can understand our desires and can have fun with us. Emotional in the sense that it can interact with us in a natural way, while also being able to express emotion and give the impression of feeling and evolving. Personal in the sense that it provides a different and unique experience for every person. 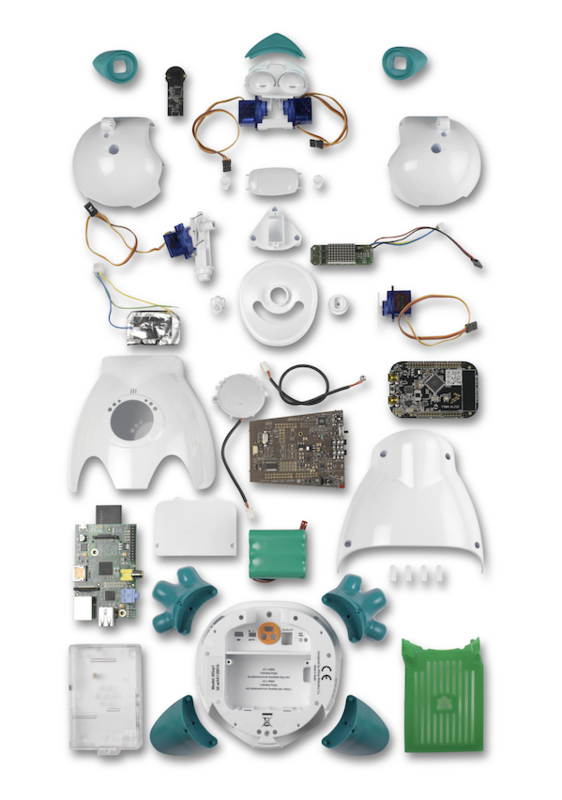 What vision or idea motivated the development of the Aisoy robot? 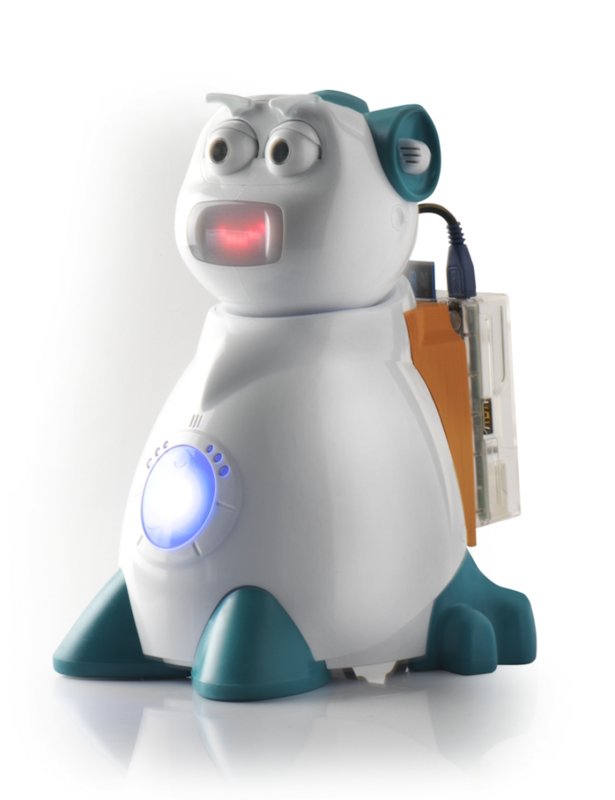 Aisoy is motivated by the idea of creating “life” with emotional (social) robots. We want to build emotional links between us and our physical and digital worlds, by giving emotions to the objects and services that we use every day. The first step we’ve taken is the creation of the Aisoy1, a robot that can interact with us in a way that we as children only dreamed of. In the creation of the Aisoy1 (our first robot), we wanted to build a platform that included cutting-edge technologies in areas such as pattern recognition, unsupervised learning, emotional and decision frameworks, natural language processing for dialogue management, automatic speech recognition, text-to-speech, and computer vision. 2MP Camera, great for face tracking! For me, one of the most interesting features of the Aisoy is the integration with cloud-based services, such as audio processing and a text-to-speech engine. Is offloading complex services to the cloud a future direction you see for robotics? What are the next services you have planned for Aisoy? The cloud is right now a key part of the ecosystem of our life and in the near future, we believe cloud robotics will be fundamental in the development of more advanced and capable robots. We are seeing the first steps in this direction already: Amazon are developing cloud-connected drones for usage in deliveries, and Google is taking a stance in the robotics world. Two companies whose major businesses lie in the cloud – it will be very interesting to watch how their access to cloud-computing resources inspire their robotic developments. In the not-too-distant future, we can certainly imagine ourselves living among connected robots, each of them sharing knowledge with us and the other robots, in a kind of shared intelligence. For a more concrete example, consider cloud services, such as speech recognition and text-to-speech, which have become commodities for our smartphones – common features, like Siri or Shazam, couldn’t exist without them. The same is happening with robots: there are capabilities, such as SLAM or object recognition, which are computationally very expensive (currently too expensive for the majority of microprocessor-based robots), but can be delivered effectively through cloud integration. Such capabilities, we believe, will become standard for future robots. We’ve bet on this since the beginning, and have already integrated cloud-based speech recognition and text-to-speech. We’re currently migrating our emotion and decision engines to the cloud so that you can use it from your robots and from other connected devices. By porting these services to the cloud, we want to give people a new kind of experience using social robotics. Basing the Aisoy on standard, (partially) open source hardware and software such as the RaspberryPI and ROS makes the Aisoy a very customizable platform. What is the coolest thing you’ve seen done with the Aisoy? There are many people working with Aisoy1 and their inventions constantly surprise us, for example: a Star Wars Encyclopedia programmed in AIDIA or the integration of Aisoy with turtlebot for making an assistant guide inside a shop. Socially, one of the coolest projects is taking place in Alicante (Spain), where several schools are preparing a stage play where the main characters are Aisoy1, programmed by children under 11 using Scratch. We were also very proud when Aisoy1 was the host of Telefonica Talentum and introduced the CEO. It was amazing. What are the next steps in Aisoy development? Now I’d like to change the focus and look at Aisoy as a company. We often hear stories of US-based startups, but very little from the rest of the world, hence I think it would be very interesting to get an insight into the startup culture in Spain. Is the Spanish ecosystem (funding, mentoring, etc) supportive of startup companies with new and novel ideas? Spain still has a long way to go in this area. Companies such as Facebook, Apple or Google, could never have been founded in Spain – their ideas were too innovative, and too unproven. Spanish investors usually invest in companies whose technology has proved successful in existing markets and who have equally successful business models – minimal-risk investments. They are happy to invest once the company has an income, but are extremely conservative in supporting young companies with innovative ideas to get off the ground. What were the major difficulties in the early stages of the company, and how / with what resources did you overcome these challenges? In the early stages of Aisoy, we had two major challenges: Finding funding, and surviving the economy. Finding funding was difficult for us. In Spain it’s easier to reach 200K€ in a “Friends, Family &Fools” first round, or even 10M€ for well-established companies with proven business model, than it was for a company like us, in the end-phase of a long-term technological development, to reach 2M€. We are very thankful for our first funding from the founders and CDTI (The Centre for Industrial Technological Development, a Spanish Public Business Entity) through the Neotec program for technology startups. Relatedly, our first years of development and production were during the high-point of the Spanish economic crisis and the Fukushima disaster (which affected hardware supplies). It was not easy for us to survive during these years, but we love robotics, believe in our vision, and have fought hard to keep pushing Aisoy forward. We’re now very proud to see the results of our efforts over the last years! In the last few years we’ve seen the development of many different strategies and frameworks for running a startup. Did you take guidance from such resources, or find them helpful in the early stages of AISoy? Nowadays people are using or talking about these methods (eg. Steve Blank’s “The Startup Owners Manual”, Alexander Osterwalder’s “The Business Model Canvas”, Eric Ries’ “The Lean Startup”), but five years ago such guidelines were hard to come by. In our case, we used similar methodologies without knowing that we were using their principles. In the end, most of it is just common sense. Looking back on the last five years, what knowledge/experience that you have now would have been useful to have when you started? What would you do differently, and what would you do the same? Use affordable 3D printers (such as the Prusa i3 we have recently built), to drastically improved the speed of prototyping, thus reducing risks by testing more and reaching the market faster. Make the hardware more modular so that we can reduce the risk of component obsolescence or supply problems affecting the whole system. In the end though, these things are a matter of continuous evaluation and improvement! Thank you for giving us this opportunity to reach your audience (we’re among them). We’re really looking forward to showing you the upcoming tools we’re developing, such as the new AIDIA and our latest development, a Chrome App to bridge with Scratch and cloud services. Stay tuned! Thank you to the Aisoy team! If you are interested in more information, check out their homepage!